How to convert 5v to 1.5v? I am a newbie. I have a power bank which gives 5 v output from a USB. Now I need to step down the 5v into 1.5v to run a small motor. I have searched a lot to find any readymade IC... But unable to find. Can anyone help me, how to convert 5v to 1.5v ? Easy: use an adjustable 3-terminal voltage regulator and connect the "adjust" pin to ground. The downside to this is that for every watt that goes to the motor, you'll burn up around 2.3 watts in the regulator. This means you'll need to pay attention to heat sinking, and you'll get really low system efficiency (but it'll work). Medium-hard: Find a step-down converter, either a design to build or a module on ebay. If you find one that's current limited and nice and robust, and choose a current capability that's well above your motor's running current (because motors always consume more when starting than when running), it may work OK. You may have to do some experimenting, because by default step-down regulators don't play nicely with motors. Efficiency will be much better. Check that the input can be set to 5 V, and the output can be set to 1.5 V. Some converters have fixed input/output voltages, others can be changed. A ready made module also contains the necessary resistors/capacitors etc. The voltage divider allows us to have a 1.5v reference (200 kilo ohm resistor), I've chosen high value resistors in order to minimize as much the amount of power being lost. 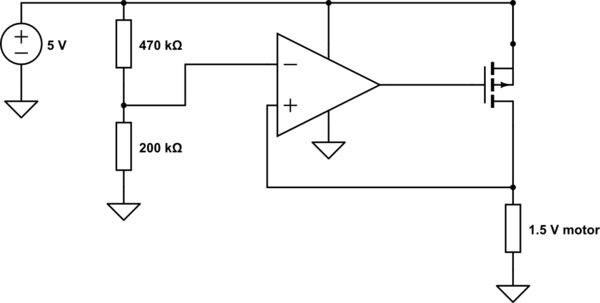 The comparator is there to quickly turn off and on the mosfet as soon as the load voltage increases over 1.5v and decreases to less than 1.5v. This very quick oscillation ensures that the voltage across the motor stays at 1.5v. Perhaps this approach is a little bit hard to understand provided that you don't have much experience. Not the answer you're looking for? Browse other questions tagged transformer integrated-circuit power-electronics step-down or ask your own question. Reduce 6 volts to 5 volts? How would I convert a 4.1(ish) volt li ion battery to 240v ac? Can I get help with measuring particle charge using oscilloscope? convert step down to step up transformer? Which step down transformer for my lovely little u.s.a guitar amp? Do Step-Down Transformers Increase Total Power Consumption? What is the best way to step my signal from 5V to 3V3?